In this lesson, we will learn how to represent data using scatterplots and transform these plots into lines of best fit. The following scatter diagram shows the test results of two exams for a class of 26 students. 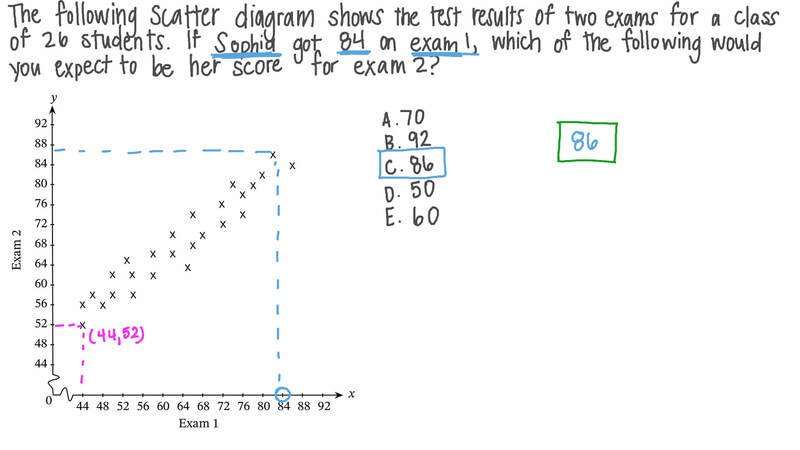 If Amira got 84 on exam 1, which of the following would you expect to be her score for exam 2? A linear regression model of the form 𝑦 = 𝑎 + 𝑏 𝑥 has been fitted to the data shown. Which of the following statements are true about the values of 𝑎 and 𝑏 in the fitted regression model? The following scatterplot shows the heights and weights of 24 students in a class. Use the scatter graph to determine which of the following would be the best estimate for the weight of a person who has a height of 150 cm. How useful would a line of best fit be for this scatterplot? Which line fits the data graphed? ANone of the lines fit the data. The scattergraph shows the body mass, measured in kilograms, against the average brain mass, measured in grams, for 15 species of mammals. Give the approximate brain mass of the point that is most likely to represent an outlier. Which species of mammals do you think this point is most likely to represent? How useful would a line of best fit be for this scatter plot? The scattergraph shows a set of experimental data (purple). Simon fits two possible regression models to the data: a quadratic model of the form 𝑦 = 𝑎 𝑥 + 𝑏 𝑥 + 𝑐 2 (orange) and an exponential model of the form 𝑦 = 𝑎 𝑏 𝑥 (green). Which of these two models appears to be a better fit for this data set? The four scatterplots show the same two variables 𝑥 and 𝑦 but transformed in different ways. Based on these scatterplots, what type of regression model would be most appropriate to model 𝑦 in terms of 𝑥 ? Fady made a pot of tea and then recorded its temperature, in degrees Fahrenheit, over the following hour. Fady concluded that the temperature of the tea, minutes after it is made, can be modeled by the exponential regression model . 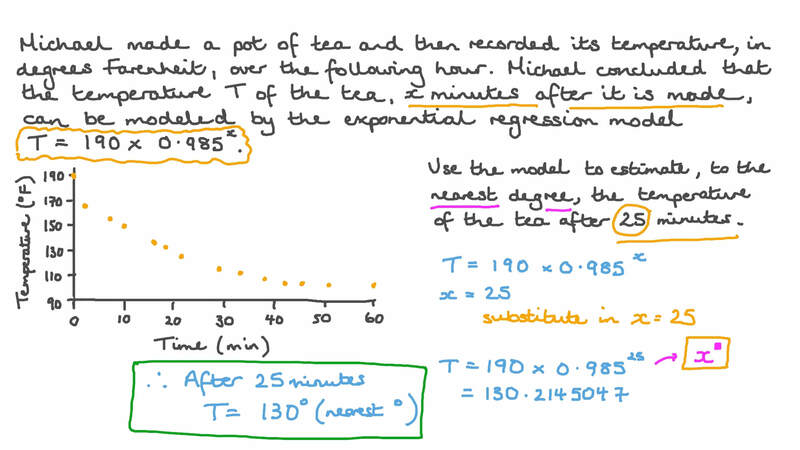 Use the model to estimate, to the nearest degree, the temperature of the tea after 25 minutes. Maged collected data on the age of a group of children and the amount of pocket money they received each week. He then fitted a linear model to this data set. Maged then calculated the residual for each point and plotted them as shown. Does a linear model appear to be appropriate for this data set? The scattergraph shows a set of experimental data (purple). Simon fits three possible regression models to the data: a linear model of the form 𝑦 = 𝑎 + 𝑏 𝑥 (blue), a quadratic model of the form 𝑦 = 𝑎 𝑥 + 𝑏 𝑥 + 𝑐 2 (orange), and an exponential model of the form 𝑦 = 𝑎 𝑏 𝑥 (green). Which of these models appears to be the most suitable fit for this data set? The scatterplot shows the average life span (years) versus oxygen consumption (cubic centimeters per gram of body weight) of 26 different species of mammals. What type of model would be the least appropriate for modeling this data? Sarah collected data on the age of a group of children and how many hours they spent doing homework each week. 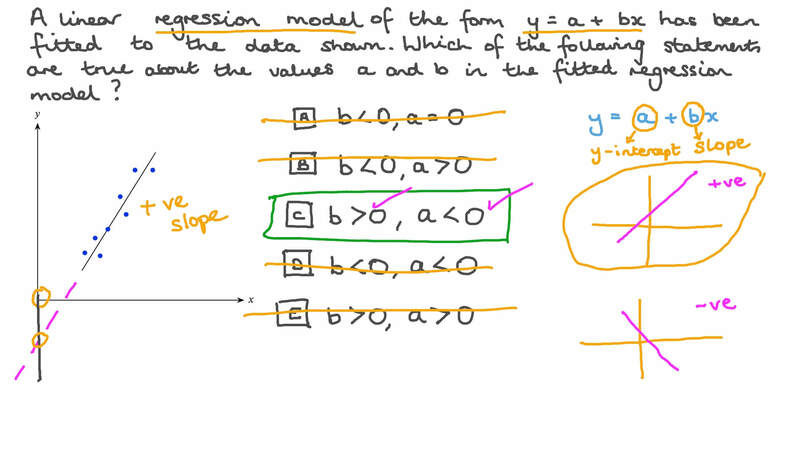 She then fitted a linear model to this data set. Sarah then calculated the residual for each point and plotted them as shown. Given that the 𝑥 - and 𝑦 -axes are at the same scale, which of the following are possible values of 𝑎 and 𝑏 for the linear regression model shown in the diagram?